Piqua’s Mick Karn drives past Elida’s Evan Unruh Tuesday night. Piqua’s Garrett Schrubb gets off a shot against Elida Tuesday night. 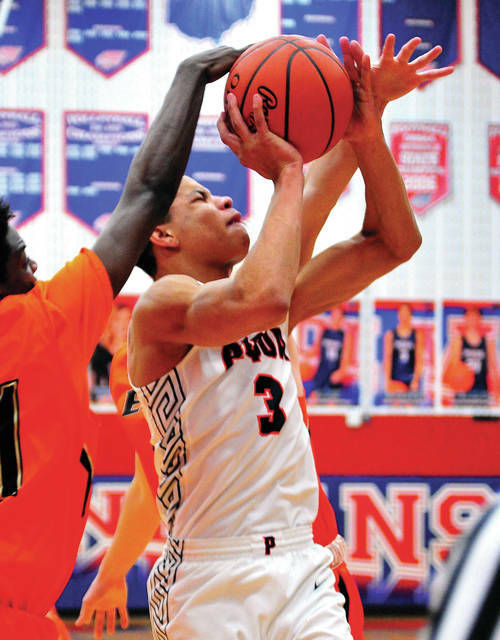 Piqua’s Trey Richmond shoots against Elida’s JaQuan Moore Tuesday night. Piquaa’s Qurri Tucker drives the baseline against Elida’s Dylan Buetner Tuesday night. Piqua’s Kameron Darner drives past Elida’s Ja’Quan Moore Tuesday night. 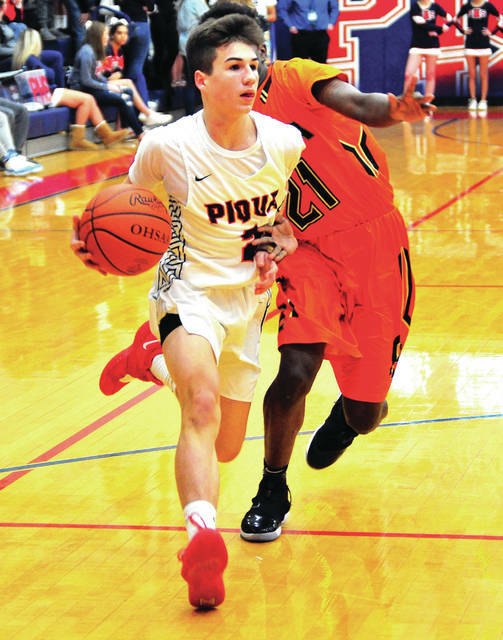 The Piqua boys basketball team had things going in the second and early third quarter against Elida Tuesday night at Garbry Gymnasium. But, the Bulldogs opened an 10-point lead early in the fourth quarter and held off a Piqua rally for a 57-50 victory. Elida improved to 7-5 with the win, while Piqua dropped to 5-8. After trailing 18-11 after one quarter, Piqua used two 3-pointers by Mick Karn and one by Riley Hill to take a 28-26 lead just before half. Elida’s Dylan Buetner hit two free throws to even the game at 28 at the break. Qurri Tucker started the second half with four quick points for Piqua and Garrett Schrubb added two free throws with 5:48 to go in the third quarter to give the Indians a 34-28 lead. But, Elida answered with 13 straight points to take a 41-34 lead to the fourth quarter. Ja’Quan Moore hit two 3-pointers to start the run and Matt Fish scored five of the next seven points, while Dante Wheeler also scored a basket. Trey Richmond finally broke the Piqua drought early in the fourth quarter, before Moore hit two free throws and Fish had a 3-point play to give Elida a 46-36 lead with 5:54 remaining. Piqua then went on a 11-3 run to close within 49-47 with 3:02 remaining. Tucker had a basket to start things, then Schrubb hit a 3-pointer and added a free throw. Richmond scored inside, before Schrubb converted a three-point play to make it 49-47. Piqua was still within two after another free throw by Schrubb to make it 50-48 with 1:42 remaining. 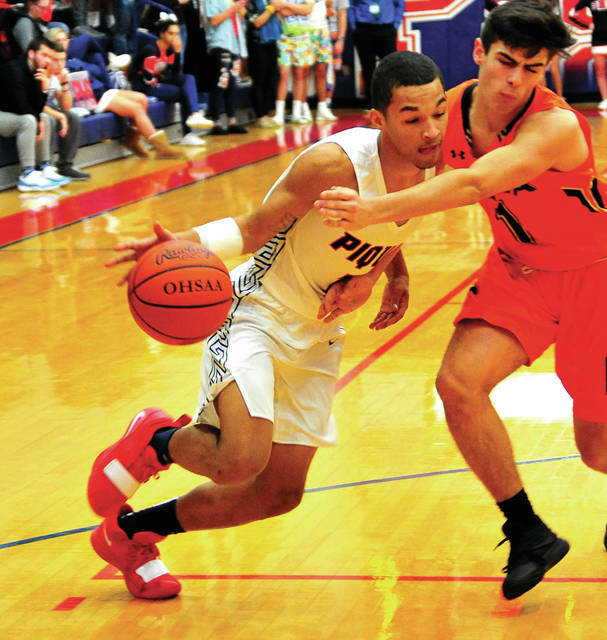 But, Wheeler scored five points down the stretch to help seal the win for Elida and Piqua could score just two points the rest of the way. The game had started with an Elida turnover off the jump and Tucker scoring on a putback of his own miss, leading to an Elida timeout just 24 seconds into the game. 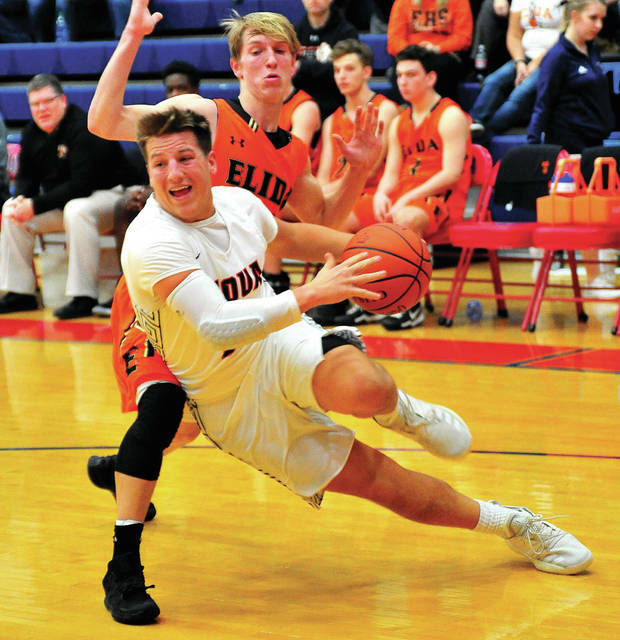 Fish responded by scoring Elida’s first 10 points to give the Bulldogs a 10-3 lead and they maintained that until Piqua gained some momentum in the second quarter and kept it close the rest of the way. Schrubb, a sophomore, had another big game with 16 points to lead the Indians. Tucker scored 14 points, Karn had eight points and five rebounds and Richmond had six points and 10 rebounds. Zach Tillman also grabbed five rebounds. Fish had 21 points and seven rebounds to lead Elida. Wheeler had 15 points, while Moore added eight points and six rebounds. Max Parker scored six points and Buetner had six rebounds. Piqua was 19 of 63 from the floor for 30 percent and eight of 15 from the line for 53 percent. Elida was 21 of 50 from the. floor for 42 percent and 13 of 20 from the line for 65 percent. Piqua won the battle of the boards 32-31, but had 17 turnovers to Elida’s 15. 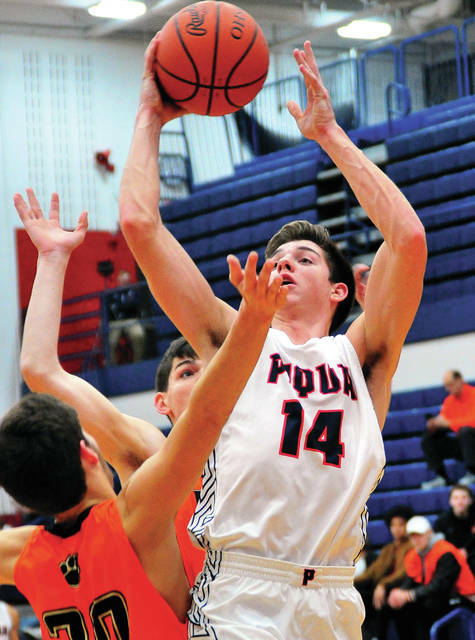 Piqua will return to action Tuesday, hosting Fairborn. Matt Fish 9-3-21, Dylan Buetner 0-5-5, Max Parker 2-2-6, Logan Johnson 0-0-0, Ja’Quan Moore 2-2-8, Evan Unruh 1-0-2, Drew Brockert 0-0-0, Drew Biglow 0-0-0, Dante Wheeler 7-1-15. Totals: 21-13-57. Qurri Tucker 6-2-14, Kameron Darner 0-1-1, Trey Richmond 3-0-6, Garrett Schrubb 5-5-16, Zach Tillman 1-0-2, Mick Karn 3-0-8, Zack Lavey 0-0-0, Riley Hill 1-0-3. Totals: 19-8-50. 3-point field goals — Elida: Moore (2). Piqua: Schrubb, Karn (2), Hill. Records: Elida 7-5, Piqua 5-8. Reserve score: Piqua 47, Elida 36.